ORLANDO, Florida – An orphaned male manatee was rescued on Sunday from the Banana River, near Cape Canaveral, Fla. A local citizen contacted the Florida Fish and Wildlife Conservation Commission (FWC) when they noticed the manatee swimming alone and was experiencing buoyancy problems. The FWC rescued the manatee from the shallow waters and transported him to SeaWorld Orlando for rehabilitation and care - making him the 500th rescued manatee to be cared for at SeaWorld Orlando since the animal rescue program started in 1976. The 285-pound manatee was given a complete health exam upon arrival at SeaWorld, including antibiotic treatment. The manatee will continue to receive around-the-clock care and the team remains cautiously optimistic that he will make a full recovery. The goal, as with every rescue, is to return the manatee back to his natural environment once he’s strong enough to survive on his own. 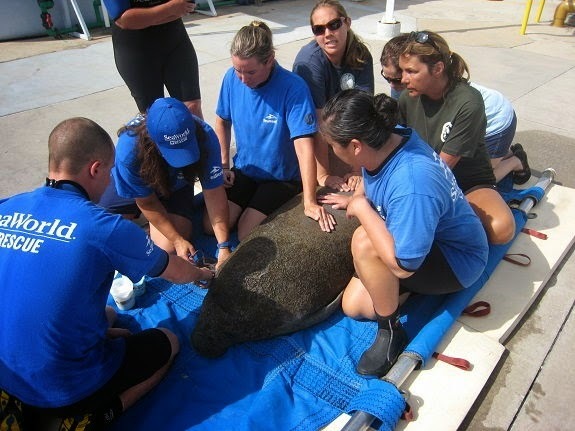 So far in 2014, SeaWorld Orlando has rescued six manatees and returned five. In collaboration with the government and other members of accredited stranding networks, SeaWorld Parks & Entertainment operates one of the world’s most respected programs to rescue ill and injured marine animals with the goal to rehabilitate and return to the ocean. SeaWorld animal experts have helped more than 23,000 animals in need - ill, injured, orphaned and abandoned - for more than four decades.